Orion is a Long-crested eagle (Lophaetus occipitalis) and opens the flying show at the Sanctuary. Orion is a male and unfortunately came to us as an imprint bird (he thinks he is human). 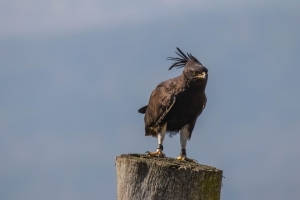 Long-crested eagles can commonly be seen sitting on perches such as telephone poles along the side of roads. They are sedentary hunters and prefer rodents such as rats and mice. Standout features of the long-crest are their extravagant headpieces and telltale white-windows on their wings.